Welcome to April 2008's Garden Bloggers' Bloom Day at May Dreams Gardens. I have news to report on the flowers this year. They are late. Or at least they are later than last year. By comparing the blooms today with those from a year ago, I can emphatically state that this year's April blooms are lagging behind last year's April blooms by a week or more in my garden. 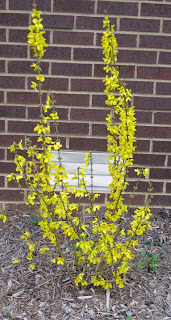 All the Forsythia are still in full bloom, including my new one, 'Show Off', planted last fall. Last year by mid-April, they were finished blooming. 'Show Off' isn't very big yet, but I can tell already that it is a bloomer, as advertised. In a few more years, when it gets a little bigger, it will be a stunning blooming shrub. And guess where it is planted? Over on the utility side of the house. It won't be that viewable from the street, but it will probably glow and be viewable from airplanes passing overhead. The violets are starting to bloom. Last year we had near record cold weather in early April which stopped the violets from blooming early and froze out quite a few other blooms. Some gardeners consider these weeds, but I don't. I let them grow here and there and wherever they want, within reason. 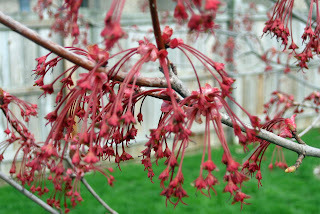 The red maple (Acer rubrum) is still blooming. By this time last year, the bloom on the red maple had long faded, and the red bud (Cercis canadensis) had already finished blooming, too. But this year the red bud is just starting to bud out, so I didn't take a picture of it for today's post. Closer to the ground, patches of Grape Hyacinth (Muscari sp.) seem to be about on schedule. But the tulips are far, far behind last year and are just starting to show some buds, whereas last year in mid April they were in full bloom. Did you notice that someone, let's call him Mr. Rabbit, has been eating the foliage on the tulips? But even though many flowers that would normally be blooming now aren't yet blooming, I can still rely on the Helleborus to put on a nice show in early spring. These blooms will hang on for quite a while. I think it is a good year for hellebores, overall, and this is the best this one has ever looked. In some ways, a slower spring is nice for a change. Everything will bloom in its time, and there is going to be more time to enjoy the later blooms that are taking their sweet time. And as the weather turns warmer, I can watch to see if the blooms catch up. Here is a list of blooms in my garden today. What's blooming in your garden today? Are your blooms early or late this year? Join us for Garden Bloggers’ Bloom Day by posting pictures on your blog or even just writing about what's blooming in your garden today. Then leave a comment here so we can find you, visit your blog, and make a fuss over your flowers. And if you don't have a blog or the time to write a post, leave your list in a comment here. All are welcome and encouraged to participate! Wow, but you sure made up for lost time Carol. It seems we are close to the same stage in blooms even if we had a very mild winter. What a huge gorgeous clump of hellebores. I'm posting early (for once) because I'll have a busy day tomorrow. Thanks again for hosting GBBD. You have such wonderful color in your garden. My violets are finished (I, too, let them run rampant), and I'm noticing that everything blooming for me is either white or yellow. 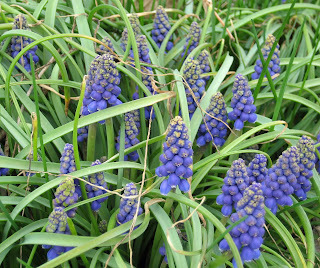 Well, there are a very few grape hyacinths and Veronica peduncularis 'Georgia Blue' just beginning to carpet the east berm. 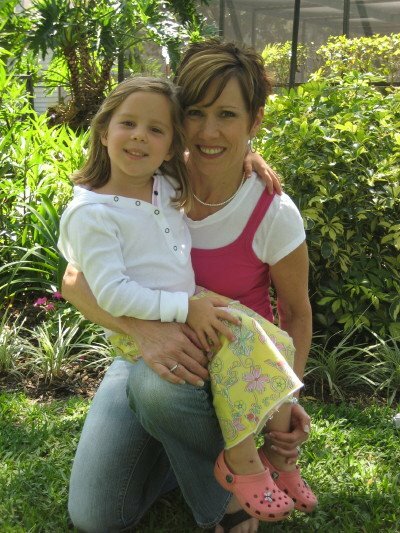 See it all at http://www.bannersbyricki.com and click on ricki's blog at the bottom of the home page. Thanks, Carol, for providing this venue. It focuses my attention in a way that my resolutions to keep track never has. I've got my Bloom Day post up. It does seem like many of the flowers that should be blooming are a little on the slow side. That's probably good since we are about to receive a pair of frosty nights. Hopefully that will end after Tuesday! I checked last year's post and several things are also later in Davis this year, although the majority seem the same. Odd, too, because we had a much milder winter this year. And I forgot to list the Italian parsley and raphiolepis on this year's post...anyway my post is up! I am glad there are places where spring may be later than normal, I thought it was too early for us. Can I give you my violets? Thanks for hosting. 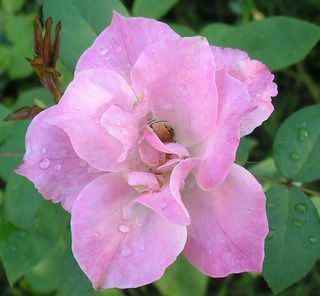 Hi Carol, my bloom day post is in one day early, I will be out on business trip tomorrow and didn’t want to miss it. That is cool flower on the red maple; we don’t get to see that here in tropics. Yes, everything is later this Spring. That stinks because I usually have tons of things blooming by the middle of April, including all my ephemerals. Your Forsythia appears to be living up to its billing - what a display for such a young plant! Mr. Rabbit visited my Tulips also, but I thwarted him before he made his way through all of them. That Hellebore is wonderful. I had to get my Bloom Day post up tonight because I have much business to attend to tomorrow, which stinks because I might have a Sanguinaria bloom tomorrow. I haven't checked yet to see where my flowers are compared to last year's, I'll have to do that. At this point I am just happy to have anything blooming after a winter that never seemed to end! My bloom day is up! It seems as though everything here is later this year, but last year I really didn't have the time to notice my garden as much, so I may simply be impatient this year. Daffodils and hyacinths are finally in full bloom at http://prairierosesgarden.blogspot.com. Strange that 4000 miles East of you (in the UK) the season should also be a week or two later than last year. 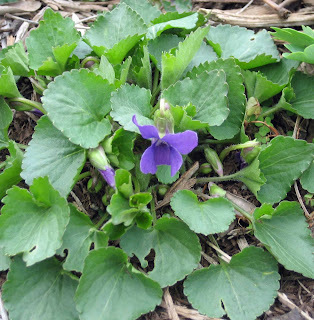 I always had violets in my Southern gardens.I love them, even though they can be very invasive. My m-i-l had them all in her grass. I looking forward to the warmer weather! Over here we are back to our regular flowering schedule. Last year we had a heat wave that started on the first of April and lasted till half May so everything was exceptionally early then. My blooms are up too at http://blissyo-elgarden.blogspot.com/ for those who are interested. My first ever Bloom Day post is up..yippie! Forsythia is adding amazing color in the spring garden. It looks like we have a regular blooming schedule in Poland. I hope everyone's enjoying their gardens today! Glad to see you are looking like spring, early or late. I agree with you, lhttp://fairegarden.blogspot.com/2008/04/bloom-days-april-2008.htmlate is better. Hmmm, there is something wrong with the code there, in the middle of the sentence, rats. We're way ahead of you - our forsythia finished blooming and turned to leaves several weeks back - but the lousy weather we've had this month has suddenly put a brake on everything here too. But the constant downpour of the last two week will be positive in the long-term. My post is up (http://balcony-garden.blogspot.com) and like every month I'm focusing on one plant in flower on the balcony. This month it's the most ubiquitous plant in Milan - sedum. This year has been much colder during March and April, I wondered if spring would ever really arrive! I love the sweet violet, I would let them grow where they like as well.. wish I had some. My post is up, happy bloom day! Hey, Carol, congrats on your nominations for the 2008 Mousies! Well deserved. My blooms are much later this year and a little on the sparse side especially compared to 2006. I am hoping for a better show in May. Thanks for your website. The latest Spring in 15 years, Carol! Very hard to find anything in full bloom right now although I've found a few. We're going to have a warm week so I expect my Spring show to start soon. As you know, violets are one of my favorite flowers. I want them to bloom wherever they want. I would like to see a purple carpet of violets. However, there isn't a single flower I dislike, (as long as it smells good) so I think I am pretty easy to please. My Bloom Day post is online now, too. Wish my hellebores looked like yours! I finally have some blooms to share for Garden Bloggers Bloom Day. Carol, What a lovely event! I didn't want to be left out again, so I put up a post even though it probably just sounds like more whining about this incessant snow. I though I may at least provide some comic relief from my frustration.... Enjoy! LOL. Though the blooms may be behind schedule, it certainly doesn't take away from their beauty. Your gardens look lovely. Your hellebore is pretty impressive, Carol and the forsythia makes such a spring splash. It would be nice to find a few violets in my borders. It's technically spring here, but in Austin that means flowering vines and roses rather than tulips. Sure hope the bunnies allow yours to bloom! Ah, now I know what will bloom in my garden in the next couple of weeks! I'm on time for once and while you are late - we seem to be a week or two early - my lilacs are bursting and forsythia are well done. We are having very erratic weather -- up to 80 some days and below freezing some nights this week. I hear ya on the lateness of flowers this year. I feel we are a couple of weeks off. Man, 41 Bloom Day posts already!? And I thought I was early. You've had a long winter, Carol, but your flowers will be all the sweeter when they finally do arrive en masse. Love those hellebores! My flowers seem to be blooming on schedule here in Austin. Here's my Bloom Day post. Just discovered this, and it looks like fun! Right now I've got a few little Grape Hyacinths and daffodils blooming outside, and a Meyer lemon tree blooming inside. Hi, Carol. I've been gone for a while, but I have a post up for this month. Wow! Carol, this is going to be a big bloom day!! Isn't it great that so many are participating? After seeing your violet, I checked on mine-not yet. The new forsythia is beautiful. Every year I say I am going to plant one...maybe this is the year! I am adding mine to the rest of the bloomers! 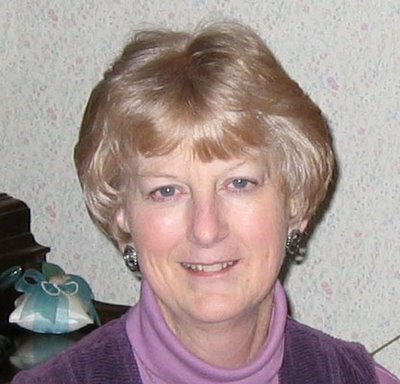 Hi Carol, Hooray for GBBD! I've put up my post. 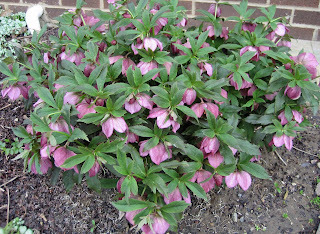 Your photo of your Hellebores could have been taken in my garden! 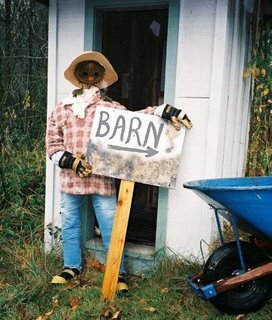 Off to the garden, it's a-calling! Here's a report of what's blooming in Florida on this unusually chilly day in April. Ooh, that forsythia is going to be a beauty when it grows up. The plants here look just about the same stage as last year, maybe a tiny bit later. I have hibiscus blooms, verbena, lantana, salvia - mostly annuals. That's it. Tulips are nearly finished as are Daffodils. Let spring take its time. We'll enjoy it longer. The cold snap last weekend has slowed things down a bit here and my Bleeding heart has caught the frost having come out too soon. I just got my Bloom Day post up -- what a lot of material to work with now that spring's finally underway. I love seeing your comparisons with last year and look forward to using this Bloom Day as a good measure, year by year, myself. My internet has been down for a couple of days I have no pictures to share except one little daffodil I posted today. So I will share here. Daffodils and vinca are the only thing blooming. 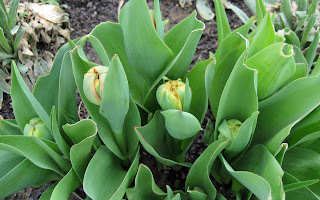 The crocus are done blooming but the tulips and iris are budding and look ready to bloom any day now. Thanks for hosting Carol. You've got quite a showing in your garden. My first Bloom Day and I had a little helper! Your hellebores look great! I agree with you on the merits of a slower spring...heck, all I had for Bloom Day was a houseplant! Bloom post is up before midnight! Will wonders never cease. Thanks for your organization skills. 'Better late than never' - isn't that what they say? You do have some nice blooms in your garden now, and that's great! My GBBD post is finally posted - the internet has been very troublesome today! What a great show considering how cold it has been the past few days. You have been nominated for a Fork 'n Monkey Award. 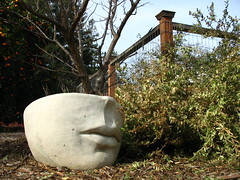 My April Bloom Day entry is posted - a treatise on gardening for all five senses! like yours, our daffodils seemed to take forever! I'm intrigued that your garden is slower than usual. Ours is too, but given all the snow we had, and the cold winds off the Bay, it's not surprising. All these other posts give me something to enjoy and look forward to. Your garden is getting full of blooms. I just love the violets, they seem so delicate. Are they fragrant? My post is up: Small Gifts. Congratulations on your nominations! Oh, and I meant to say that some things are blooming earlier, and some later, than last year. It's a mixed bag! I finally have flowers in my yard! Predominately yellow - now that I look at them - but flowers nonetheless! Garden Bloggers Bloom Day was exactly what I needed after a stressful last few days dealing with our taxes. Yuck! You have quite a list, Carol! I'm happy to report that I actually have some outdoor blooms for Bloom Day...at last! My plants are a week or more behind last year's too. I envy you your beautiful Hellebore. Mine (newly planted last summer) looks dead, but I keep hoping to see some life in it. We can't get our Forsythia to bloom! Thanks for hosting this Carol. A little bit late as it is just past midnight. But my post is up. gasp! That hellebore. It is awesome! Stuff is late in my garden also. It's more like March here. We had snow last night. Aahh, it appears that spring has arrived almost everywhere! It seems like new things are blooming every day now. It is great to stop once a month and see what's blooming in everyone's garden. Hello all, I'm joining, I'm joining! It's not a GBBD post, but my post shows you the huge forsythia hedge I have in my backyard. My GBBD for Zanthan Gardens is up. Although this week has been cool (in the 70s), the weather has been very dry and the wildflowers are fading and going to seed very rapidly. I'm glad you saw it when you did. Another week and the meadow will be gone. I'm envious of your tulips, even if they are rabbit-nibbled. I feel like I have lots more flowers this year than I did last April, but then again, last April I was knee deep in newborn care so maybe I just didn't notice as much. Your forsythia will be a stunner when it gets big. Wow, Carol, you sure have a big response this month. I think we are all so glad that spring has finally sprung! Here is my post for this month. The garden is still pretty bare, but at least there were a few things blooming. I've got many blooms this month. This is my 3rd month participating and my best one yet. I love to read what blooms everyone else has. It will take days to get through this list. What fun! 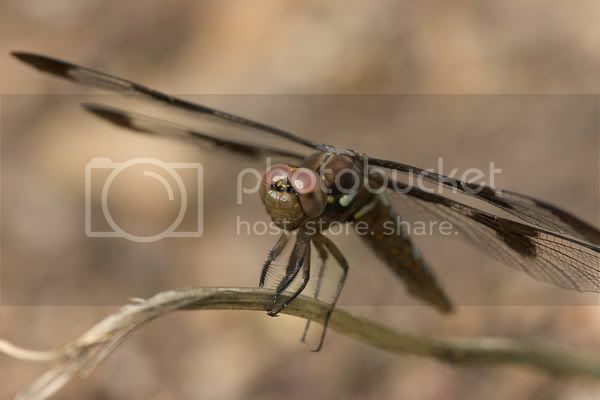 Pollinators-welcome has an April bloom post ready. Carol: Wow! You've got your work cut out for you... 89 comments so far. Are the tulips in this post some of the ones you planted last fall by your front patio? I think I remember you dug lots of holes for tulips??? I'm so envious-- to imagine-- tulips growing in one's garden-- the only way I get to enjoy them is if I purchase cut flowers and pop them in a vase! It is so cool the way you keep records from year to year of what/when you have blooms.It inspires me to extend my record keeping to include those details. To answer your questions... mostly seasonal blooms are right on time here in Florida. I almost didn't make the day but I finally had some time to work on my GBBD which is up now. I too posted early. Intended to post today too, but was cursed with a power outage! I'm at a web-cafe, but neglected to bring the camera! Anyhow, I posted earlier as I simply couldn't wait for bloom day. I'll try to post a late post too, with cherry blossoms! Your red maple picture is gorgeous. I can't picture what the other phases will be. I don't think I've ever seen one bloom. I really, really wanted to do this today. But I'm a tax-procrastinator. All my free spring break time was spent gardening. So today...tax stuff. I'm going to post tonight or, more likely, tomorrow. I LOVE the concept of being able to compare on the same day from year to year. Brilliant. Thanks so much for the concept and for 'inviting' everyone. Also, a side question...I know wordpress.com and my blog is now on my own, hosted site using wordpress. I've noticed that MANY garden blogs use blogger/blogspot. I notice that most of the blogger/blogspot blogs I visit have all the options that you have...google/blogger, open ID, URL, anonymous...but some just have google/blogger and open id. I've been signing in with my own URL when possible, but using my 'old' wordpress address on openid when I can't. I'm guessing that's an option people set up on their blogger/blogspot blogs? 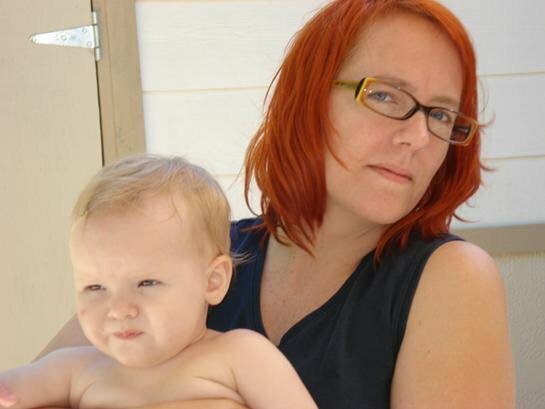 And related...is the only way I can get a pic up by signing up for a google/blogger account? I know this is not 'bloom day' related, but I figure this is a post being viewed by people that can answer my questions...so thanks in advance. 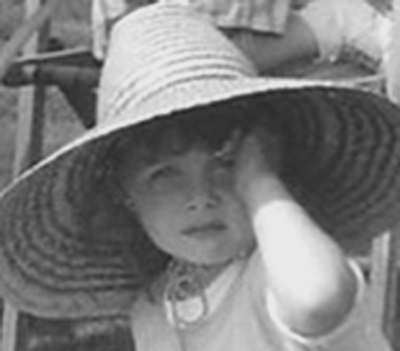 And I'll be heading 'home' now to start putting together my own bloom day post. All... WOW! Thank you to everyone who shared their blooms today. It is overwhelming the response. I visited a lot of blogs this evening, but haven't finished making the rounds. I'll return tomorrow evening and the next evening and get to everyone eventually. And then, if it works out, I'll post a link list to all the bloggers who joined in. The world is certainly a better place with all of our gardens blooming this April. Everything is late here also. You have quite a long list, Carol! I'm making a note to myself that I need to add some early-blooming daffodils, and some of those crocus that you were stalking earlier in the year. My bloom post is up... better (a little) late than never! My post is up, with only 25 minutes to spare on the 15th. Good thing I'd already done my taxes! I actually DID get a post done tonight! It's not perfect. But it's okay for a first effort. My list is not as big, but it's there;) Happy Spring. The wenches got their GBBD post up. And with 6 minutes to spare, before it's Wed. the 16th! Your helleborus is gorgeous and it was nice walking through your flowers. The world certainly seems a better place with so many blooms all around. I had posted my bloom list yesterday and had left a comment on your blog, or rather, I thought that I have left a comment. In the process of posting it must have got lost somewhere as I didn't find it in your comment list today. Carol: Have you been up all night answering all these comments? This must be a record! Good for you and keep up the fun! Hey, Carol! What a great idea you had! Thanks so much for organizing the Bloom Day. Looking forward to next month! . . .sigh . . . up here in the Perthshire Hills of Scotland we barely have daffodils. My Bloom Day Post is up a day late. Thanks for the reminder! I missed it! I didn't know! But luckily my blog has a number of pictures of what is blooming. I'm in Indiana, too, and I can't wait for the tulips to appear! I'm new to blogging and (somewhat) to gardening. Since we're in the same spot, I'll definitely check back for info! Wow, 110 comments so far. Is that a record? I've been AWOL from bloom day posting for a couple of months, but last night I managed to get some pics up before midnight. I missed it as usual, when opportunity knocked, I was right there in the backyard looking for four-leaf clovers ;-) But let me just say what a great idea this was, and although I managed to miss this a couple of times now, I'll hopefully remember next time. However I have also spent the first days of spring magic crawling around my garden and clicking away. 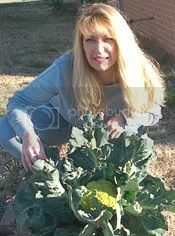 You have a wonderful blog Carol, a place that will make any gardener browse for hours. Congrats to everyone on wonderful springtime shots and may there be many more. My Allium Schubertii has been a pleasant surprise - and survived recent tornadic winds! This GBBD thing has really taken off. Your hellebores are lovely. The good thing about having your garden bloom late is that you can enjoy it longer. I forgot about GBBD and finally posted it. Well, I just discovered you guys - but have been busily documenting the spring blooms for the past two weeks. The irises have been the star of the garden, but the roses are also beginning to bloom. This is my garden's 3rd spring - and I am SO pleased with what is happening. Shoot, I can even harvest a whole handful of strawberries at a time this year, instead of just 2 or 3 berries! I'm late! But then, so are the blooms this year. LOL. Here's my post for Garden Bloggers Bloom Day! Okay, my post is way, way late but I wanted to let you know so you can know how much I love participating in bloom day, even if I don't always get it up on time. I love your hellebores! Beautiful and so distinctive.